From casual to pandering to deadly, there have been several disturbing reports about anti-Asian American racism in the news. In the more casual forms of racism, it seems that the whole using someone’s name as a way to retrieve an order at fast food places has gone horribly awry. About a month ago a Chick-Fil-A cashier at a store in Irvine, California assigned racist names to two customers and even typed them into the printed receipts (images here). And, just in the past few days, a woman went into a Papa John’s pizza chain in New York City and got called a racist name on her receipt (see that receipt here). Here’s an idea – maybe we could just go back to the “we’ll call your number when your order is ready?” system. This is the kind of casual racism that isn’t talked about, but that Asian people deal with on a regular basis. We are the invisible minority, and we rarely get the kind of attention that other minorities do. I’ll just state the obvious here and point out that these incidents didn’t happen in the distant past or some rural backwater, but in supposedly tolerant, cosmopolitan urban areas in the present, putatively post-racial era. “It’s an election year, so you know what time it is. Racist campaign ads! This latest gem is from someone claiming to be a Ron Paul supporter, attacking Republican presidential candidate Jon Huntsman for his “un-American” values. … Here we go with another round of equating China with all things evil. Complete with an extra Oriental soundtrack — never has Mandarin made to sound so sinister. [This video] is one of the most unabashedly racist attack ads we’ve seen in a while. The ad asks whether Huntsman’s values are “American” values or Chinese? And, then rather sinisterly photoshops Huntsman into a portrait of Chinese leader Mao Zedong while thoroughly mixing the fear-mongering metaphors and comparing him to the “Manchurian Candidate.” This kind of strategy is what some people refer to as “dog whistle racism,” in other words, political campaigning that uses coded words and themes that appeal to conscious or unconscious racist concepts and frames. For example, the terms ‘welfare queen,’ ’states’ rights,’ ‘Islamic terrorist,’ ‘uppity,’ and ‘illegal alien’ all activate racist concepts that already exist within a broader white racial frame. 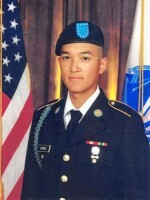 Among the most disturbing news are the details that are emerging surrounding the death of Private Danny Chen in October, 2011. Chen, 19, grew up in New York City’s Chinatown, and is thought to have committed suicide in Afghanistan after enduring racial taunts and bullying (although some now question whether it was suicide at all). A group of his superiors allegedly tormented Chen on an almost daily basis over the course of about six weeks in Afghanistan last fall. They singled him out, their only Chinese-American soldier, and spit racial slurs at him: “gook,” “chink,” “dragon lady.” They forced him to do sprints while carrying a sandbag. They ordered him to crawl along gravel-covered ground while they flung rocks at him. And one day, when his unit was assembling a tent, he was forced to wear a green hard-hat and shout out instructions to his fellow soldiers in Chinese.ethnic slurs. At other times, they forced him to do push-ups or hang upside down with his mouth full of water. The eight men later charged in connection with his death are all white and range in age from 24 to 35; they include one lieutenant, two staff sergeants, three sergeants, and two specialists. Danny’s parents, of course, are inconsolable at the loss of their only son. What in the world could Arizona’s challenge of the Voting Rights Act and the requirement passed in 12 states that citizens show government-issued picture ID’s before voting have in common? The answer is simple: Both are being used by white racists to impede people of color’s right to vote and nullify their vote’s impact. One tactic is the removal of the Federal Government oversight of the often tainted state electoral process. The Voting Rights Act was passed in 1965 as part of Lyndon Johnson’s anti-racist agenda. It outlawed poll taxes and other obstacles that impeded people of color’s access to the ballot box. Arizona has filed a lawsuit challenging the constitutionality of parts of the Voting Rights Act. The parts in question require states that did not meet certain requirements in 1972 to secure federal approval for any state legislation or change that could affect voting. Arizona is one of the states. We are asking the Independent Redistricting Commission not to dilute the impact of minority voters. A second subterfuge pertains to the requirement that citizens show government-issued ID’s before they can vote. In an August 26 New York Times Op-EdJohn Lewis, a Democratic congressman from Georgia, discusses a law passed by 12 Republican state legislatures this year. The law requires “that citizens obtain and display unexpired government-issued photo identification before entering the voting booth.” It so happens that as many as 25 percent of African American voters lack adequate identification. Conservative supporters of the law allege that this regulation is necessary to forestall voter impersonation. However, there is no evidence that voter impersonation is a widespread problem. When the state of Indiana defended its picture ID provision before the Supreme Court, it could not produce evidence of even one instance of the offense in Indiana. Similarly, in the last ten years Kansas, another state that passed the legislation, experienced a larger number of alleged U.F.O. sightings than claims of voter impersonation. I believe that if these white attacks fail, more will follow. Racism is a tough nut to crack. The Charlotte Observer newspaper recorded a Delta (ASAConnection) incident of probable discrimination against two Muslim clerics who, ironically enough, were travelling to Charlotte for a meeting that will deal with Islamophobia. Imams Masudur Rahman, an adjunct professor of Arabic at the University of Memphis, and Mohamed Zaghloul said they and their bags were checked twice by security agents at the Memphis airport before boarding the 8:40 a.m. Delta Connection Flight 5452 to Charlotte. Organizers said more than 150 religious leaders from across the country will meet through Sunday to discuss prejudice and fear of Islam or Muslims. As I have described elsewhere, Middle Eastern Americans have been part of the U.S. mix since about 1900. And European American legal-political authorities have grappled with defining them racially. Between 1909 and 1944, at least eight court decisions by European American judges legally assessed whether certain Arab Americans were “white.” Four ruled that they were, and four ruled that by “common knowledge” or “legal precedent” they should not be considered white. Note too that the many white supremacist writers of the early twentieth century saw them as “parasites” and “Mongolian plasma” that would “contaminate the pure American stock.” Middle Eastern immigrants (both Christians and Muslims) were then cataloged with southern and eastern Europeans as “inferior races” by European American intellectuals. They suffered extreme stereotypes that many European Americans drew from the already entrenched white racist frame, including old derogatory terms such as “blackie,” “camel jockey,” and “sheeny.” Some of this racialized stereotyping and framing clearly persists on a large scale today, renewed by events of the last few decades. In addition to physical features such as skin color and facial features, many European Americans, in the early period and today, have used distinguishing markers that are cultural in character, such as clothing (hijab, turban), language accents, and religious customs. In the too common racial-ethnic framing of Muslim and Christian Middle Eastern Americans today, certain cultural markers are added to skin color marking to target them for racialized stereotyping and discrimination. Basically, what the ABC crews does is set up a “matched study” – a white guy and a black guy are matched on every quality except skin color – and films the results. They put these two gentlemen, both recent college grads, in St. Louis, Missouri to establish themselves. They are sent to find work and a place to live. Hidden cameras record the very different treatment that they receive at almost every turn. It’s a compelling look at how everyday racism operates and the way that it “grinds exceedingly small,” as Malveaux says. Of course, those of us who study racism know that this continues to happen and it continues to “grind exceedingly small” for those who experience it. It’s definitely time for some enterprising investigative reporter to re-make this classic video about everyday racism.